I absolutely love attending golf tournaments for the camaraderie, networking, competition, and philanthropy, but as a business owner, I no longer have the 8 hours to spare for every non-profit tournament that is out there. And on the planning side, you’ll see hundreds of hours spent by volunteers and coordinators to sometimes break even or only make a 20-30% profit. Street Swings has created a new way to raise money for charity by utilizing our traveling golf experience to create the networking opportunity your guests desire while raising money for your cause. We take the best elements of the golf tournament; networking, long drive, closest to the pin, and putting competitions, opportunity drawings and building awareness around your nonprofit. But we leave out the 8 hour days, and planning hours. 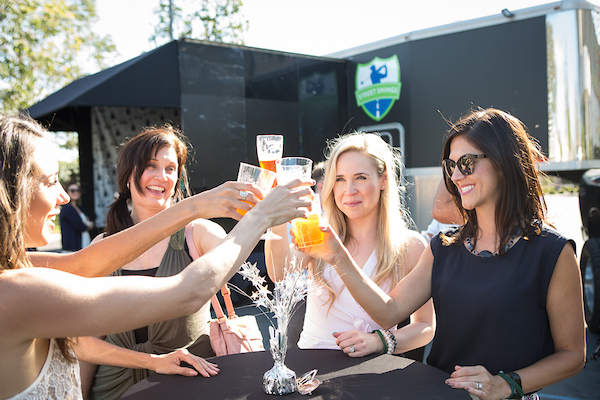 We envision you hosting an event in your non-profits parking lot, setting up a bar, adding on food trucks and while the golf festivities are happening you’re also taking guests on tours through your facility. And the last piece that we deliver to make your event a huge success is from our talented CEO. Jenn Harris who helped SDGE raise $35,000 in their Inaugural golf tournament year and $138,000 this past year. Her magic on the back end to reduce costs and increase profits will not only be integral in helping you raise funds for your charity but will also give you the road map to raising funds for future events! Let us know if you’d like to host a quicker and more fun event that still meets your fundraising goals! Fill out the form here, give us a call at (619) 206-1343, or email us at [email protected].